Lexar Media today announced that its unique LockTight system is being localized and will be available to a greater number of security-conscious photographers worldwide. The LockTight System, on display this week at the Photo Marketing Association International Show (PMA), is a valuable tool for photographers in fields such as forensic photography, scientific research, military, law enforcement and mass media. The LockTight System will also be available in the popular Secure Digital (SD) format, and due to worldwide interest, is being localized in French, German, Japanese and Spanish. 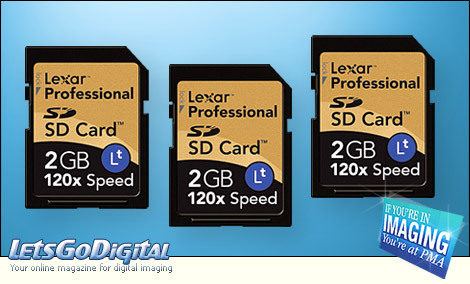 Lexar Professional LockTight CompactFlash cards are currently available in capacities of 512MB and 2GB. Lexar CF memory card - High-speed - "Our goal is to continue to make it easy to incorporate card-level security into the professional workflow of photographers using the industry leading formats, secure digital and compact flash, anywhere in the world," said John Omvik, director of professional product marketing, Lexar. "Like many law enforcement agencies working with the LockTight system, photographers in other vertical markets can incorporate it into their working process to experience the valuable peace of mind in knowing that their stored images and information are safe." Lexar LockTight system - "The size of the card is only one of the key elements in the digital photography process," said David Honl, professional photographer, who is currently featured on Lexar's digital photography website. "The speed at which I can move the content from my card to my computer is also extremely important, particularly when I've spent the day filling multiple cards while shooting in RAW format with my Canon EOS 1D Mark II. The speed of the card directly contributes to an improved digital photography workflow," he added. Lexar LockTight flash memory cards - When used in conjunction with a camera that supports the system, LockTight flash memory cards employ a unique functionality to protect data, and as a result, LockTight cards are always "locked." A computer or camera cannot read or write data to/from a LockTight card until a critical authorized authentication process takes place between the LockTight card and the host computer or host camera. This authentication process employs 160-bit HMAC SHA-1 hash algorithm. Lexar LockTight CompactFlash and Secure Digital flash memory cards - Beyond security, Lexar LockTight CompactFlash and Secure Digital flash memory cards deliver professional-level performance that includes a minimum sustained write speed capability of 80X and 120X, respectively, enough to take advantage of a digital SLR's burst mode shooting feature. (Lexar defines "X" within its speed-rating system as equivalent to a minimum write speed capability of 150 kilobytes per second). Lexar LockTight allows photographers to maximize all of the popular high-performance features incorporated into their digital SLR camera, but adds security functionality to the photographer's working process. Lexar Professional LockTight CompactFlash cards are currently available in capacities of 512MB and 2GB. Lexar will display the LockTight System along with its full line of professional photography products at PMA.